Apples of Gold Jewelry's "By Grace Through Faith" diamond cross necklace in 14K white gold is a beautiful gift for the special woman in your life, to allow her to remember that God is always with her! This 3/4 inch tall by 1/2 inch wide cross pendant features a cut out design on the arms of the cross, which are budded toward the ends. 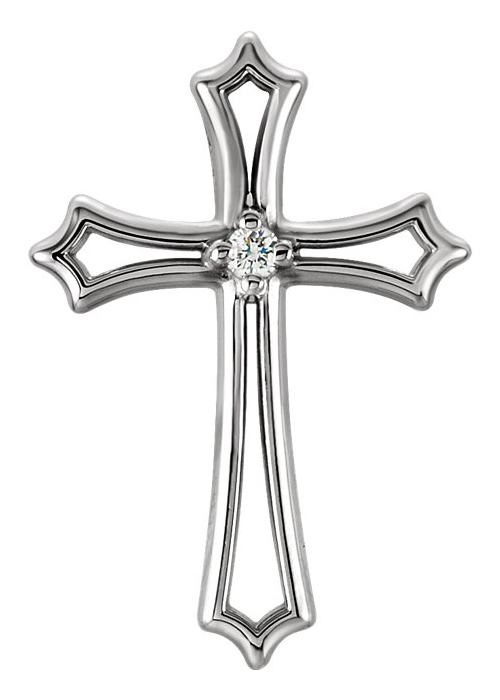 In the center of this white gold cross pendant is a single 0.015 carat diamond, which is G-H color rated and I1 clarity rated. The cross pendant features a hidden bale behind the cross. "For by grace are ye saved through faith; and that not of yourselves: it is the gift of God: Not of works, lest any man should boast. "(Ephesians 2:8-9). We guarantee our By Grace Through Faith Diamond Cross Necklace to be high quality, authentic jewelry, as described above.